Do you still believe that fish are dumb and cannot feel pain? That we do not have to worry much about how they are cared for or caught? Think again, says Associate Professor Culum Brown, in a review article in Springer’s journal Animal Cognition. The research notes that fish cognition and their sensory perception are generally on par with that of other animals. Brown therefore argues that more consideration should be given to fish welfare and anti-cruelty issues. Brown says that most people rarely think about fish other than as food, or as pets. However, they are second only to mice in terms of the numbers used in scientific research, and the more than 32,000 known species of fish far outweigh the diversity of all other vertebrates combined. Very little public concern – which is so important to inform policy – is ever noted about fish welfare issues. Brown believes this relates to incorrect perceptions about the intelligence of fish, and ultimately of whether they are conscious. Such attitudes are also influenced because humans rarely come into contact with fish in their natural environments. Brown’s review focuses especially on bony fish. It suggests that fish are, in fact, far more intelligent than many previously believed. Fish have very good memories, live in complex social communities where they keep track of individuals, and can learn from one another. This helps to develop stable cultural traditions. 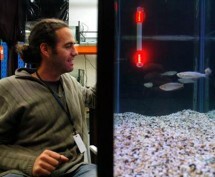 Fish even recognise themselves and others. They also cooperate with one another and show signs of Machiavellian intelligence, such as cooperation and reconciliation. They build complex structures, are capable of using tools, and use the same methods for keeping track of quantities as humans do. For the most part the primary senses of fish are just as good, and in many cases, better, than that of humans. Their behaviour is very much the same as that of primates, except that fish do not have the ability to imitate. The level of mental complexity fish display is on a par with most other vertebrates, while there is mounting evidence that they can feel pain in a manner similar to humans. While the brains of fish differ from other vertebrates, fish have many analogous structures that perform similar functions. Brown concludes that if any animals are sentient, fish must be considered to be so too.